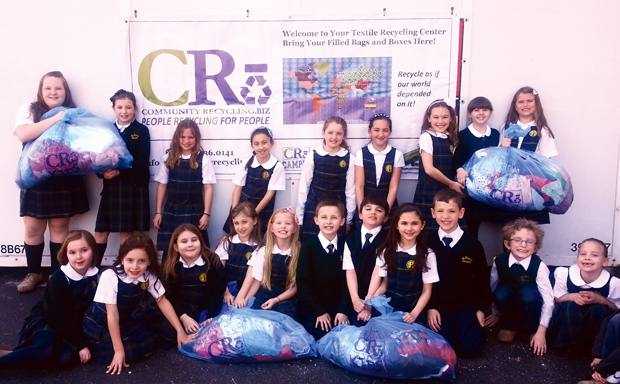 St. Francis de Sales School in Aston has partnered with Community Recycling KIDS and ShoeBox Recycling, for-profit recycling companies, to sponsor a shoe and clothing recycle program during the month of April. The textile recycling program is designed to promote reuse of items while educating children about diverse cultures in far off places. In addition to helping the environment and teaching children about recycling and sustainability, the students will participate in a global mapping project where they will learn about where their items for reuse go and the diverse groups of people who receive them. Recycling bins are placed throughout the school, and students are encouraged to responsibly discard of their gently used shoes. The collection also serves as a fundraiser for the school. The community is invited to participate by donating used clothing and shoes. A pod is located in St. Francis de Sales’ top parking lot by Drayton Road to drop off any used clothing or shoes after Masses. An estimated 300 million pairs of reusable shoes end up landfills each year. Please contact Barbara Ann Kerezsi at 484-459-5310 or Racine258@aol.com with questions.